Cooking grass fed beef is slightly different than cooking grain fed beef. It's leaner, so it requires lower cooking temperatures and shorter cooking times. Throughout the Seven Rules of Producing Great Beef article series, I focused on all the little details that the farmer must pay attention to while raising beef cattle to ensure that the beef is tender and flavorful. But the chef has just as much influence on beef tenderness and flavor as the farmer does, perhaps even more so. While a great chef can only improve a tough steak so much, a chef who does not understand the meat they are working with can completely ruin even the most tender flavorful beef through only a moment’s inattention and completely undo all the hard work that the farmer put into producing tender flavorful beef. The process of raising flavorful and tender beef doesn't stop when the cattle leave the pasture. Cooking strategy matters. A lot. That's why it's important to be aware of the slight differences between grass fed and grain fed beef so that the cooking techniques used in the kitchen to prepare the beef preserves the flavors and tenderness that the farmer worked so hard to create. Grass fed beef requires lower cooking temperatures and shorter cooking times because it is leaner. Turn down the heat and check the meat sooner than you normally would! 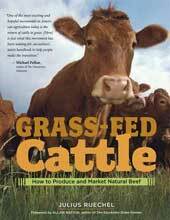 Want to learn more about the differences between grass fed and grain fed beef? Check out this article about grass fed vs grain fed beef! Grass-fed beef is leaner than the grain-fed beef you may be accustomed to buying from your local grocery store. Consequently, while grass-fed beef cooks (and tastes) very similar to grain-fed beef (I personally think grass fed meat has even better flavor! ), there are a few key differences that you need to be aware of when it comes to thawing and cooking grass fed beef to ensure that you preserve its tenderness and flavors. If you follow these tips for cooking steaks and roasts, your grass fed meat will have all the tenderness and flavor (or more!) that you have come to expect from your favorite beef recipes. Never microwave beef to thaw it. Microwaving beef to thaw it makes the beef tough because the microwave turns some of the moisture to steam, which allows this valuable moisture to escape from the beef. Preserving moisture is key to keeping your beef tender. While this rule applies equally to grass fed beef and grain fed beef, grass-fed beef is even more vulnerable to moisture losses during microwave-thawing because it has less external fat to trap steam from escaping. Another important tip for thawing beef is to always remove beef from the original wrapping paper, cellophane, or butcher paper prior to thawing to prevent the tastes and smells of the packaging from leaching into the meat where they will compete with the flavors you are trying to create during the cooking process. It is also a good idea to rinse your frozen beef immediately after removing it from the packaging to remove any ice that may have absorbed the flavors and smells of the packaging. The best way to thaw beef quickly if you are in a hurry and don’t have time to let it thaw on the fridge or counter (and without thawing it in a microwave) is to take the frozen beef out of the butcher wrapping, give it a quick rinse, then put it inside a watertight Ziploc bag. Submerse the entire package in cool water inside a bowl or in the sink. Make sure that there are no large air pockets in the bag - you want to ensure good contact between the water and the meat, otherwise it will not thaw any faster than simply leaving the meat out on the counter. Close the bag with the majority of the bag held underwater to help force as much air out as possible. It’s okay to let the meat package float in the water bath, but if you are in a hurry you can hold the meat under water by placing a heavy item on top of the package to hold it underwater. This ensures maximum contact between the wrapped meat and the water. A 2-lb package of ground beef or steaks usually thaws sufficiently within 15 - 30 minutes to be able to begin cooking. Even if the meat does not completely thaw before you pull it out of the water, the frozen center has typically softened enough that you can cut it with a knife or break apart the remainder of the ground beef in the frying pan with a spoon or spatula. If the temperature of your beef changes too rapidly during the cooking process, it can cause the meat fibers to contract, which will make your meat tough. A rapid temperature change will also cause moisture to be escape from the beef through condensation. Moisture is a key component of beef tenderness. When cooking steaks, it is a good habit to remove your steaks from the refrigerator several hours before cooking so your steaks can warm up to room temperature before they are thrown on the grill. This reduces the temperature range that the meat has to adjust to when it begins cooking. While this tip is valid for any meat that you want to grill, it is even more important to pre-warm grass-fed steaks to room temperature before cooking because grass fed beef has less external fat than grain fed beef. Fat acts as an insulator to slow down how quickly your beef changes temperature during cooking. Leaner beef has less fat to insulate against rapid temperature changes when it is put on the grill. So, by pre-warming your grass-fed steaks to room temperature before cooking, you avoid the rapid wide-range temperature changes that could cause meat fibers to contract or moisture to be lost to condensation. 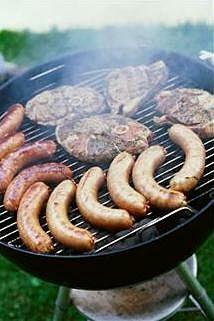 Heating meat to a certain minimum temperature kills bacteria - this is a simple precautionary food safety strategy. Cooking changes the protein structure of the meat, which gives cooked meat a different texture and flavor and makes it more digestible. Changing the proteins during cooking to achieve a desired flavor and texture depends not only on the temperature of the cooking process, but also on the rate of temperature change experienced by the meat during the cooking process. A slow temperature change during cooking allows the protein fibers to remain relaxed. A very rapid temperature change is a shock that will cause protein fibers to contract. Slow-cooking steaks and roasts ensures that the proteins don't contract and become tough during the cooking process. Slow-cooking meat at lower temperatures also means less moisture in the meat will turn to steam and escape. Compare the tenderness of steak vs. beef jerky or of an apple vs. dried apple slices and you'll know what I mean about how important moisture is to tenderness. Moisture and beef tenderness go hand in hand. Your cooking process needs to prevent excessive moisture loss from your meat. Searing beef at high temperatures to create an outer crust is a great technique to lock in moisture, but cooking steaks and roasts at high temperatures during the remaining cooking time will cause the meat to lose too much moisture and dry out during the cooking process, which will make your meat tough. Since fat acts as an insulator, it should come as no surprise that lean beef cooks faster than fatty beef because the heat from the grill, oven, or frying pan is able to penetrate through the entire beef cut more quickly. Since grass-fed beef is leaner than grain-fed beef, expect to shorten your cooking times by 10-25% when using grass fed meat in your recipes. Just start checking your grass fed beef roasts and steaks a little sooner than you normally would check your store-bought grain fed beef to make sure you don't overcook them. Since heat is able to penetrate through lean beef easier than through fattier beef, you should adjust your recipes to use slightly lower cooking temperatures when switching from grain fed to grass fed beef. Reduce cooking temperatures by 10-15% when cooking grass fed beef. So, if a recipe normally calls for 350° cooking temperatures, turn down the heat to around 300-315°. For best results when grilling, begin by searing the outside of your steaks to create a crust to lock in moisture. Then turn the grill to low to finish the cooking process on low (slow) heat to prevent excessive moisture losses and protein fiber contraction. If you're using a meat thermometer to gauge when your beef is sufficiently cooked, the USDA recommends cooking steaks and roasts to a minimum internal temperature of 145°F as a food safety precaution. The USDA's temperature recommendation for beef is based on cooking grain-fed beef since this is the most common beef source available on store shelves today. In grain-fed beef, 145°F equates to beef cooked to medium rare to medium. Grass-fed beef usually reaches the medium rare to medium stage when the internal temperature reaches 120°F to 140°F. 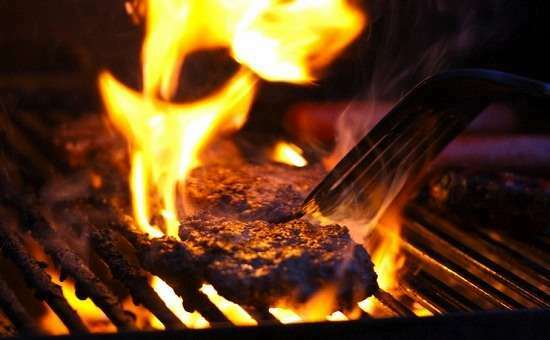 Ground beef, whether it is grass-fed or grain-fed, should always be cooked to a mimumum internal temperature of 160°F. The take-home message here is that grass fed beef cooks faster and at lower temperatures than grain-fed beef because it has less external fat to insulate the beef during the cooking process. So when cooking grass fed beef, turn your heat down and check your oven sooner than you are accustomed to in order to achieve the same degree of 'doneness'. The temperatures in the table above are based on measuring temperature with a meat thermometer immediately upon removing beef from the grill or oven. Expect the internal temperature of the meat to rise another 5°F in the next 3 minutes after it has been removed from the heat source. Meat continues to cook even after it has been removed from the grill or oven until the internal temperature cools sufficiently to stop changing the protein structure of the meat. Adjusting your cooking techniques and recipes to switch from grain fed beef to grass fed beef is extremely easy. Turn down the heat (which also reduces your energy bill) and reduce cooking times (which saves you time and more energy). and preserving moisture inside your meat during thawing and cooking. What are your favorite grass fed beef cooking strategies? Do you have any favorite cooking techniques for when you cook grass fed beef? What are your favorite recipes for when you eat grass fed beef with your family? Share them in the comments box below! And don't forget to share this article with your friends through social media so they can also enjoy the next time they serve grass fed beef for dinner!